Walsine Pierce: BETTER OFF THAN MOM AND DAD? Yep! Am I Better Off FinanciallyThan They Were? ﻿Gallup asked in a national poll, "Think of your parents when they were your age. Would you say you are better off financially than they were, or not". Four in five Americans aged 65 and older say they are better off financially than their parents were while those of an younger age say the same. High-income Americans are significantly more likely than those with lower incomes to say they are doing better financially than their parents were when they were the same age. Still, even a majority of lower-income americans say they are better off financially than their parents were. I FIND THESE POLLS TO BE VERY BELIEVEABLE! Things not at all related to the polls which you might find interesting is that my parent's oldest and youngest, Henry and I, have our mother's looks and personality. The two middle children, Ray and Elizabeth, definitely had Dad's looks and personality. 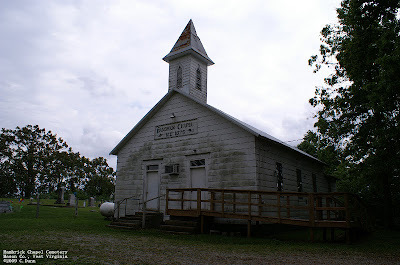 The picture above is of Hambric Chapel, deep in the hills of West Virginia, up a narrow road miles from the Southside of the Great Kanawha River. My great grandparents, Indivan and Elizabeth Pierce were married here and are buried in the church graveyard. The church which I attend today is not much different. 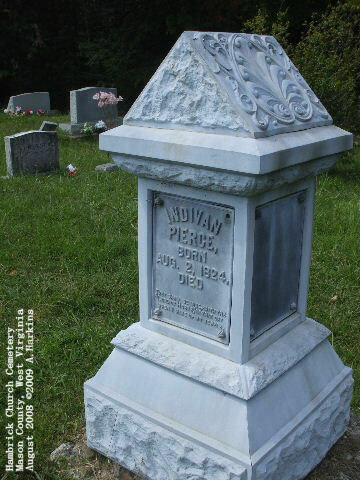 Indivan, who has an American Civil War tombstone, may have had more than I do. I have a copy of his obituary. It said that "He was a Christian and that he owned two farms". Yes, obituaries were a bit differnent in 1910. While I do not own even one farm, Julie and I live in a home we own, and used to rent out, own a lakeside retreat and have an ongoing lease on a beach front, penthouse suite just south of Myrtle Beach, SC. We plan to winter there after another year. I have two meaningful pensions and social security at age 80. Julie still works and earns far above average income. Indovan had a civil war pension. How do we measure up? I'm not sure. Down through the generations, finance not withstanding, our's is a disposition to a fun loving life. I have often heard my Grandmother, Sarah Elizabeth Pierce, 1857-1946, say that she was the best shodisher in Frazer's Bottom. I also love to dance, I have taught dance classes and I call square dances. This is a picture of my son, Mark, and his daughter, Jillian dancing at her wedding. Their wedding waltz was truly beautiful and they received a resounding round of applause. ﻿﻿Dad never owned a new car, never had a car really until late in his life. Dad was so proud of me when I bought my first new car in 1959. He would be amazed that today we own two cars and a van. He would have loved my Lincoln Town Car pictured below. I seriously doubt that my Grandmother, Betty Pierce, ever traveled more than 50 miles from where she was born. My parents together probably never got more than 250 miles from where they were born. I'm a world traveller, and am planning a round-the-world trip before I die, hopefully. My daughter, Kimberly, has already bought me a back pack for the trip. In addition to loving my Town Car, Dad would be amazed at my high tech Terra Trike on which I am at this very moment planning another attempt at a cross country ride, backed up with a van this time around. The picture below, not a very clear one, is of my wife, Julie, and I heading to the Grand Ball in Vienna, Austria.